Deciding which 1911 will grace your wall, safe or side is by no means an easy decision. For many, there is no other option than an iteration of the full-sized timeless design laid down by John Moses Browning in the early 1900’s. 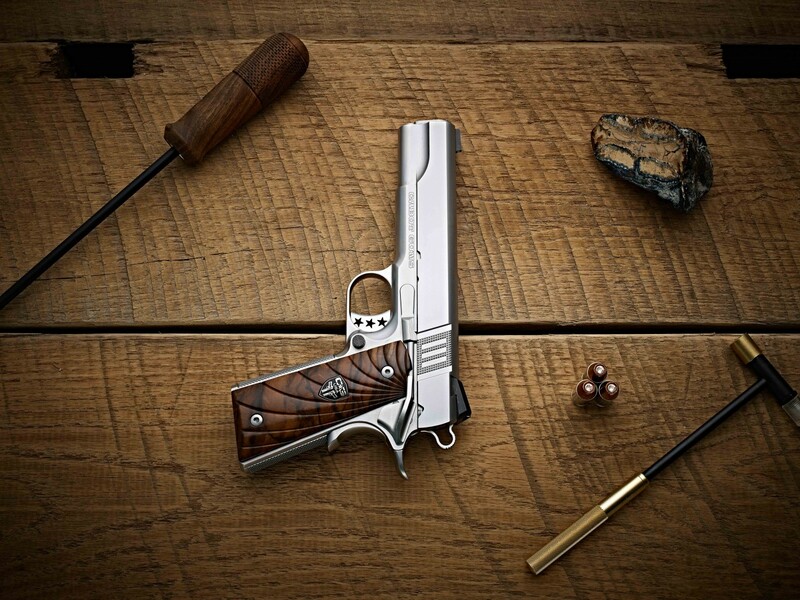 For Cabot’s team, the 1911 obsession has birthed the S100. The S100 – Cabot’s Government sized quality custom 1911 into the reach of those searching for a cut above the rest. Made in the USA – and with a frame and slide crafted from a solid block of 416 American steel – the S100 represents a commitment to American quality. Cabot’s quality obsessed team decided to go hands-on with the S100. 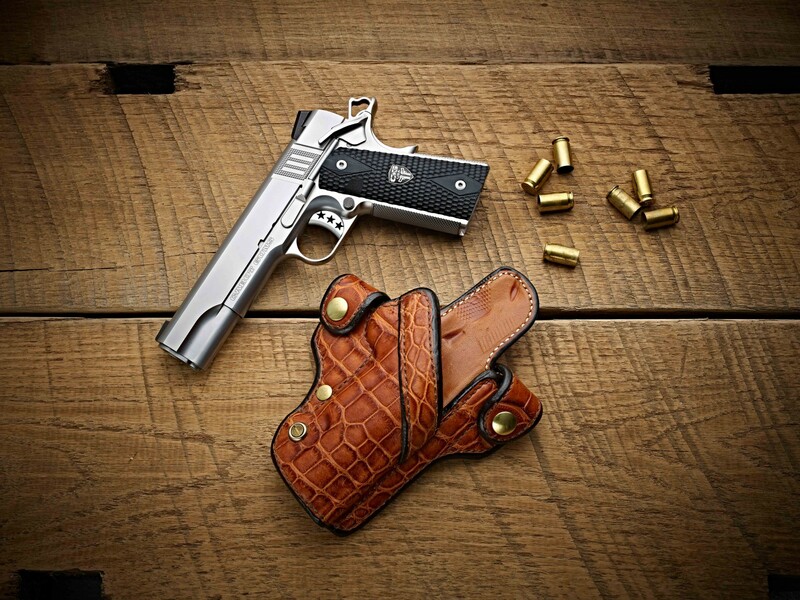 Each pistol’s frame and slide receive a personal hand fitting in the final stages of assembly, ensuring that a custom 1911 is unlike any other – and that your new handgun has passed not only rigorous computer measures of quality control, but also passed the test of careful scrutiny by a breed of American craftsman committed to excellence, driven by passion, and satisfied with nothing less than perfection. Complete with finishing touches you’ve come to expect from a Cabot Gun and a few more – a barrel beautifully crowned flush to the bushing, chamfered slide pin stop hole, magwell beveled to enable faster and more consistent magazine swaps, and a hand polished end of the full-length guide rod. Cabot’s perfection-obsessed team cut no corners in our creation of affordable luxury. Nothing’s been overlooked in creating the S100. For the connoisseur of the 1911, none could be a finer embodiment of pure functionality wrapped in black G-10 grips, or in optional Walnut or countless other options. The rear of the pistol carries Cabot’s signature Trinity Stripes and checkered cocking serrations, providing for aesthetically pleasing functionality with every rack of the slide. Standard atop this newborn piece of 1911 history is Cabot’s reverse dovetail front sight. Fitted from the front of the pistol, the bushing completely covers the mount-point, leaving no unsightly dovetail along the side of the slide. Serrations run along the entirety of the top of the slide, from the rear sights to the chamber and on to meld seamlessly with the front sight, eliminating the potential for slide glare, and naturally leading the shooter’s eye to target. A full-length sight radius ensures that it rests on the shoulders of the shooter to capture the full potential of the S100. The S100 Government Model brings to the 1911 purist a touch of modern styling, but preserves the fit and function of John Moses Browning’s original perfection. Know you’ll never need to enact Cabot’s lifetime warranty, but rest assured that the entire Cabot team stands behind the S100. Also available in full left-handed configuration, this masterpiece comes in a stainless finish, or as an option for added protection and distinction Cabot’s DLC (Diamond Like Carbon) PVD Proprietary Coating. The S100 awaits your orders. Take full advantage of Cabot’s mirroring process, and for the first time bring home a pair of perfectly matched left and right handed 1911′s. Twist Rate: 1 in 16 in.